And just like that, it became eighty degrees and hot! hot! hot! in the Windy City. #summertimechi is well on its way. Andrew and I rolled down the windows on our way to dinner and talked about all the food festivals and outdoor concerts we want to attend this year! I feel like last year with the move and the start of residency we got to do fun things but not all the classic things one should do when they live in this beautiful city during this beautiful season. So we're making up for that this year. It helps that our schedules are a little better and we're also a little more seasoned at this whole residency thing. That being said, baking has taken a little bit of a backseat again while I wrap up intern year. I've got a couple weeks left on the wards and then a couple weeks of nights and then will be taking Step 3, another big, annoying test but then I'm free! My little list of summery things includes a bike ride along the lake (we discovered in Indy this month that Andrew can indeed actually ride a bike! ), grilling hot dogs on our balcony, and sipping wine on rooftops with my favorite ladies. Plus planning for our next big trip! Yes, we are going to London and Paris in November (!!!) and I have never been to Europe so suffice to say I'm so very giddy about the whole thing. Tell me where I need to eat! What I need to see! And the last thing I'll say about the summer is that this is my favorite time of the year for desserts. Ice cream cones, juicy fruits, and the summer pies! I may just bring out the ice cream maker as I have been perusing through my Jeni's ice cream books and all I can think about lately is how delicious mango sorbet sounds, and the fact that we have too many mangoes in the fridge right now. I like my fresh mangoes a little underripe and these ones are probably a little past that point now, so sorbet sounds like their destiny. But this post isn't about mangoes, it's about strawberries! I initially wanted to use rhubarb as Yossy's recipe originally intended, but my grocery didn't carry any. So I settled with strawberries and it ended up being just as wonderful! The sweet berry pairs well with the floral rose and altogether it is my hello to summer. Have a happy weekend, may it be filled with drippy ice cream cones, hot dogs, and laughs! Whisk the flours and salt into a large bowl. Add the apple cider vinegar to the ice water. Using your fingers, press and break up each cube of butter into the flour so that you create small pieces of butter coated in the flour, with most of the pieces the size of peas. Work quickly here - the goal is to keep the butter cold. If it seems warm, stick the bowl of flour and butter into the freezer for a few minutes. Pour 8 tablespoons of the water-apple cider vinegar mixture into the flour mixture. Use a wooden spoon to stir the water into the flour. You may need an additional 1-2 tablespoons of water to hold the dough together. You should be able to take a handful of the dough and easily squeeze it together without it falling apart. I usually use a wooden spoon to begin with and then transition to using my hands to press it all together. Split the dough into 2 equal pieces and form each into a disk. Wrap each disk in plastic wrap and chill the dough for at least 2 hours before using. In a large bowl, add the sugar, flour, lemon zest, and salt and whisk to combine. Add the strawberries, lemon juice, and rose water. Toss the strawberries with this mixture to coat. Remove one pie dough round from the fridge. On a lightly floured surface, cut into 4 equal pieces and roll each piece into a 5x5 inch circle between 1/8-1/4 inch thick. 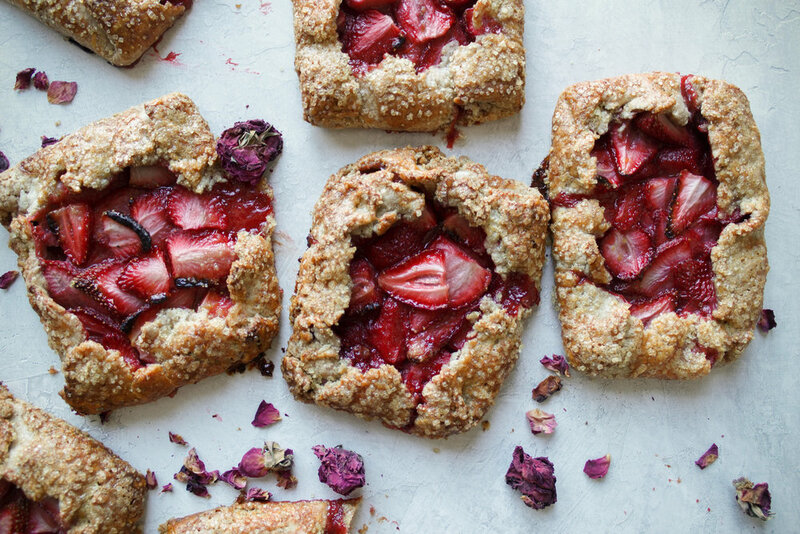 Arrange 2-3 tablespoons full of strawberries onto each piece of dough, leaving a 1/2 inch border around all sides. 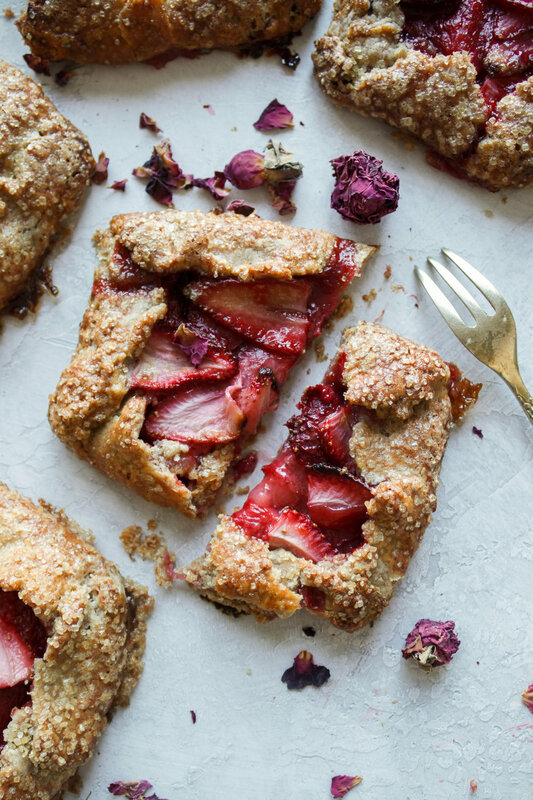 Fold the excess dough on the edge up and over the strawberries and press the edge gently with your fingers to keep them folded up. Put the galettes onto a baking sheet and place in the freezer. Repeat this process with the second half of dough. Wait 15 minutes, or until the galettes are very firm. Reserve the juices for the next step. Position two racks in the center and lower third of the oven, and preheat the oven to 425 F. Take the galettes out from the freezer and brush the edges of the galette with egg wash and sprinkle generously with turbinado sugar. Spoon some of the strawberry juice over the top of the galettes and place the galettes in the oven. Bake unti lthey are deep golden brown and crisp, 30-40 minutes. Remove from the oven and let cool slightly before digging in. Best served with whipped cream or ice cream, but delicious all on its own.